As I have mentioned, I enjoy reading true crime books each year. I usually pick one up in the summer when I spend a good deal of time watching Investigation Discover on cable. 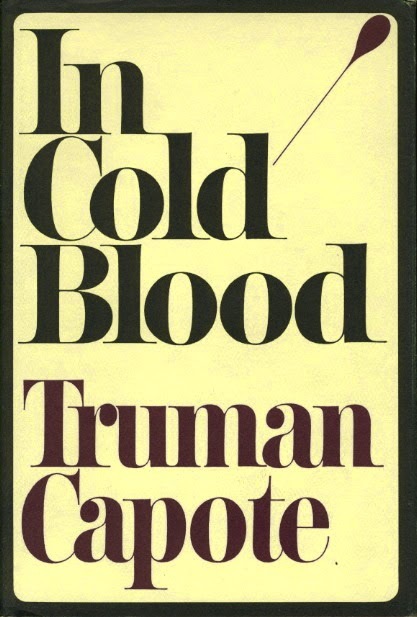 This year I decided to read what many consider to be one of the best true crime books ever written, In Cold Blood by Truman Capote. In Cold Blood tells the tale of the murder of Kansas farmer Herbert Clutter, his wife and two of his four children. After learning of the murder Truman Capote traveled to Kansas to write about the crime. I know nothing of the crime but I have heard of the book before and I have always wanted to give it a read. Original Cover of Capote's Work, The Same in the Carlson Library! Some consider Capote's work to be a classic not only in the true crime genre, but also through all of non-fiction. I have just started the book but I can tell it is unlike any true crime book I have ever read before. Capote's use of language is not what I expect while reading a typical true crime book. It is like I am reading a classical piece of fiction. The vocabulary and language used is definitely more advanced than current true crime books which are usually presented as one would read in a newspaper. This will be the first book I read by Capote, so I have to admit his style is new to me as a reader. I look forward to providing a full review later this month. Remember kids...and parents, keep reading this summer!